Univ. of Florida Univ. of Florida Univ. of Florida Michigan State Univ. 8 improving agriculture must be based on long-term and broad-based perspectives. 21 under contract No. AID/DAN-4054-C-00-2071-0O. 8 implemented create a situation in which rapid progress is difficult. 12 productivity, socio-economic, resoxirce, and ecology. More than one indicator 13 will be necessary to characterize the sustainability of a particular system. 16 the system under study. 11 needed for existing models and data bases. 25 the region where they were developed. 25 decision support systems for sustainable agriculture (DSSSA) are presented. 9 weather condition in the region. 14 minimizing water pollution, soil loss, and destruction of natural forests. 23 attribute data bases, analysis tools, and decision aids. 17 be required to aggregate and summarize regional or sub-regional information. 25 practices being analyzed during a session. 15 on growth and yield. 13 environmental quality under alternative practices or plans. 15 models are included in a regional decision support system (Lal et al., 1990). 5 climate change on U.S. agriculture (Adams, et al., 1990). 18 form the basis for this decision aid at the field scale. 1 region with acceptable characteristics of any of the predicted attributes. 12 analysis tools are included to proyide users with credible planning tools. 15 and expert systems must then also be applicable to the region under study. 17 need to be revised to include regional expertise. 19 the crop/soil models will need to perform as a part of the overall system. 9 this resource and affect the basic productivity of the site. 16 to 230 C at the site (Goedert, 1983). 26 years of cultivation (Bowen et al., 1990). 6 250, and 300 kg/ha) were simulated to obtain a yield response to applied N.
23 in water stress due to its lower water holding capacity. 25 losses in this hypothetical example may or may not be of major consequence. 4 additional N to maintain yield. 11 sustainability at the field scale. 16 60-year sequences of cropping practices. 2 run in sequence with fallow periods (bare soil) between crop seasons. 11 any of the rotations. 20 similar to the first example may show some loss in productivity. 11 on management practices, soil, and climate. 18 systems but were not considered in this example. 13 periods. It is for this reason that long-term experiments are so important. 18 In this chapter, a systems approach to study sustainability is proposed. 15 conditions and to allow them to evaluate different policies and plans. 18 the appropriate setting in which analyses are to be performed. 9 public, farmers, and policy makers. 2 Adams, R. M., C. Rosenzweig, R. M. Peart, J. T. Ritchie, B. A. McCarl, J. D.
3 Glyer, R. B. Curry, J. W. Jones, K. J. Boote, and L. H. Allen. 1990. 4 Global climate change and U.S. agriculture. Nature 345:219-224. 6 effects of land use and management on water quality. Ph.D. Thesis. 10 soybean insect pest management. Ag. Systems 30(3):269-86. 12 financial analysis review expert system. Ag. Systems 31:19-34. 14 nitrogen availability to subsequent maize crops. 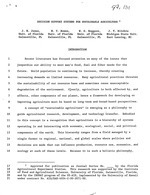 Agronomy Abstracts. 15 Am. Soc. of Agronomy, Madison, WI. p. 14. 18 and Modeling. Plenum Press, New York. 19 Goedert, W. J. 1983. Management of the Cerrado soils of Brazil: A review. 20 J. Soil Sci. 34:405-428. 22 Modeling of Small Watersheds. Amer. Society of Agr. Engineers, St.
3 Abstracts. American Soc. of Agronomy, Madison, WI p. 16. 4 Hornsby, A. G., P. S. C. Rao, J. G. Breath, P. V. Rao, K. D. Pennell, R. E.
7 Department, University of Florida, Gainesville, FL 32611. 8 IBSNAT. 1986. Decision support system for agrotechnology transfer. 10 University of Hawaii, Honolulu, HI 96822. 16 Decision Making. A. Weiss (ed.). University of Nebraska, Lincoln, NE. 20 T. Howell, and K. H. Solomon (eds.). ASAE, St. Joseph, MI (In Press). 3 Illinois. Plant Disease 67:459-463. 6 grasslands. Soil Sci. Soc. Am. J. 51:1173-1179. 8 agricultural management. Ag. Systems 29:49-66. 13 management (NTRM) model: Technical documentation. Research Report. 14 USDA-ARS, St. Paul, MN. 16 biological and socio-economic modeling in Guatemala. Research Report. 17 The Edinburgh School of Agriculture, Edinburgh, UK. 40 pp. 20 Conservation Research Report 26., USDA, Washington, DC. 22 determining the relationship between erosion and soil productivity. 23 Trans. Am. Soc. Agric. Eng. 27:129-144. 3 application. Plant and Soil 120:11-22. 8 University of Hawaii, Honolulu, HI. 8 pp. are likely to be non-sustainable. systems, natural resources, and the environment. site or farm within the region. stability and sustainability of agriculture in a region. desired economic, production, and environmental goals. useful in. studying agricultural sustainability. proposed Decision Support System for Sustainable Agriculture. the same soil after 15 cm of topsoil erosion (A). kgN/ha, N maize-fallow with no N applied, A soybean-fallowmaize-fallow with 150 kgN/ha on maize, and soybean-fallowmaize-fallow with no N applied.